The more correct name for the “NATO” strap is actually the “G10. In 1973 the band made its debut in the British Ministry of Defence Standard 66-15. For soldiers to get their hands on one, they had to fill out a form known as the G1098, or G10 for short. Issued G10 straps were nylon, only made in “Admiralty Grey” with a width of 20mm, and had chrome-plated brass buckle and keepers. Another key trait was a second, shorter piece of nylon strap attached to the buckle. Since the strap was to be used by the military, it needed to be functional and fail-safe. The extra nylon had a keeper at its end through which the main part of the strap passed through after it had been looped behind the watch . As long as the strap was passed through properly and snugly on the wrist, the case would stay exactly where it was needed. Since 1973, the G10 strap has seen only slight modifications. The current version has been downsized to 18mm and now has stainless steel hardware. 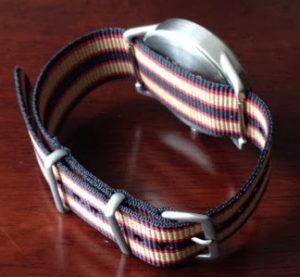 In 1978, a company known as Phoenix took over production of MoD-spec G10 straps, and would be the “real deal” if one was looking for it today. 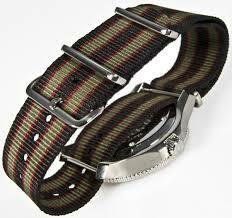 The most notable feature of a NATO strap is its single-piece construction; most other straps are composed of two separate pieces, and can only be applied by removing both of the spring bars that attach to the watch. 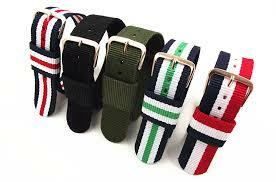 NATO straps are simply woven underneath the spring bars, so they can be removed or applied very easily. The addition of a watch keeper strap ensures that the watch case will remain firmly on your wrist even if one of the spring bars breaks. All of these characteristics make NATO straps an excellent choice for nearly any situation. 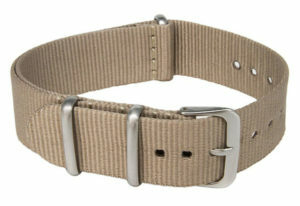 Not long after the simple “Admiralty Grey” G10 was issued, British military regiments began wearing straps honoring their respective regimental colors with stripes of all colors and combinations. One strap’s stripe pattern has become more famous than all the rest, but to call it a G10 or a NATO strap is actually a misnomer. 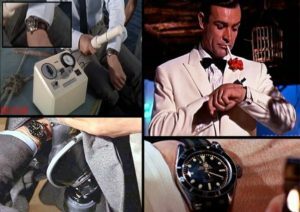 When Sean Connery’s Bond famously wrist-checked his “Big Crown” Submariner in Goldfinger, he revealed a striped nylon strap. The strap was notable because of its navy blue color with red and green stripes. 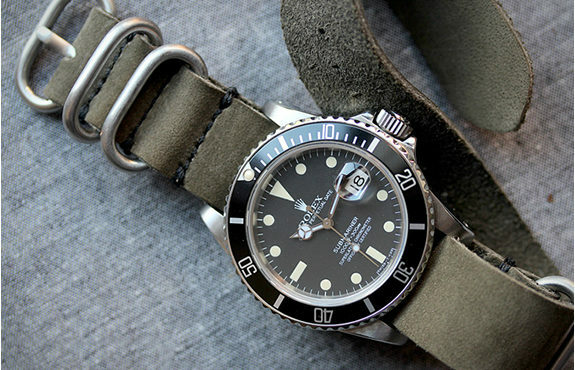 Many watch enthusiasts have labeled this strap as the “Bond NATO”. 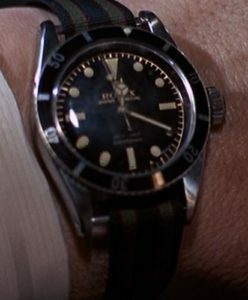 Despite the strap’s similarities to a G10, Goldfinger began filming in 1964, nine years before the first MoD G10 strap was issued. It’s clear that the strap Connery wore had a very simple one-piece construction, and distinctly different than a true NATO. G10s have been heavily trending upwards over the last five year. While it may be a fad that eventually fades, they don’t appear to be going away in the short term. 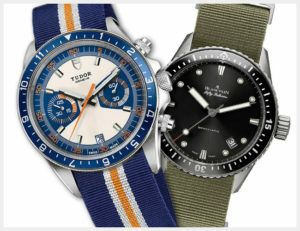 Watchmakers like Tudor, Blancpain, Hamilton and Bremont have been either throwing in a G10 as an accessory to a watch purchase, or offering one as the main strap option. While they come in varying degrees of quality, a good one is a trustworthy piece of equipment with a rich history. Very cool. My father was on loan from AT&T to the Underwater Sound Lab in CT during ww2, to work on SONAR. At that time, he wore a waterproof Rolex on a nylon strap, and from then on, preferred to use those kinds of straps, whatever they were called. He received a very nice solid gold Swiss watch on his 40th anniversary with AT&T, and put even that on a nylon strap. I always thought that very strange, as a kid. When I got older, I was heavily involved with my own work with the military on military bases in the summertime, and saw everyone wearing watches on nylon straps in searing heat, and I got it. They are light, cool, and you wash them every so often and they last for years. Besides, both band pins need to fail for the watch to fall to the ground. These bands have everything practical in their favor. What a great story! I’m going to forward this to my grandson. I have always preferred the G-10 style watch band as it is stylish and can be easily removed for cleaning as they do get “stinky” after a while, especially in the summer. Since my days as a Navy diver, I’ve always preferred nylon straps. I like what people often call a Zulu strap which doesn’t have the redundant piece of nylon that goes between the watch back and the wrist. Also the ones issued by the Navy with Benrus watches was black and had blackened brass buckles. They last a long time. I still have one in regular service since 1982. Great blog Mark! I’ve never worn a nylon strap but will certainly consider this for some of the watches I wear when I’m more active. Very nice Mark. Thank you. Where can I get one of these? Haha. I’ve enjoyed switching straps for my Sub, and have a bunch of NATO (in my case I prefer ZULU – like Wayne). I find tropical weave straps, particularly those made of “Perlon”, most comfortable for Summer use. There are no holes punched into these – the “poker” on the buckle slides between the weave just where you want it. Informative and fantastic article! I really enjoyed this one!